Thrive is dedicated to celebrating the connection between physical and mental health. The goal is to rally all those who not only seek personal accomplishment in their endeavors but also strive to be a positive agent of impact in their communities. Joining Team Thrive is a not only a fundraising commitment but a dedication to utilizing your endeavors as a platform for outreach, education, and activism! What is your platform? Are you participating in your first marathon or a seasoned veteran of endurance sports? Maybe you’re getting involved in one single event, or have an ongoing passion. Perhaps your platform is a gym, a bike, or a fast car. Team Thrive is inspired by the late Dan Hohs, a versatile athlete who found wellness through competitive endurance sports. Dan Hohs was a beacon of hope and positivity who found balance and control over his challenges with bipolar disorder through physical endeavors. In 2014, Dan began working with HFTD to develop Team Thrive, programming that expressed the empowering connections between healthy bodies supporting healthy minds. Dan aspired to share his experiences and passion for physical activity to challenge stigma as well as offer encouragement and inspiration to others. On October 7, 2017, Dan Hohs was out doing what he loved, being active in nature, hiking trails in Golden, Colorado, when a rattlesnake bit him. Dan tragically succumbed to his wounds. Dan had an illuminating character and an uncanny ability to inspire others. This gift empowered others to not only seek personal accomplishment but also strive to be an agent of impact in their communities. A perfect example of that inspiration is Sarah Moss, a close friend and mentor of Dan who has stepped up to be Team Thrive’s torchbearer. Dan was such a big part of Sarah’s life as he offered encouragement during training and support in everyday life. They traveled together for races and supported each other on whatever adventure they were to tackle, and now Sarah carries Dan’s spirit into rallying others to join Team Thrive and share HFTD’s proactive prevention message. Sarah found a love for endurance sports in 2002, and since then has completed 25 half marathons, 19 marathons, 6 half Ironmans and 3 Ironmans. She is honored to be Team Thrive’s ambassador with a commitment to utilize her endeavors as a platform for outreach, education, and activism! 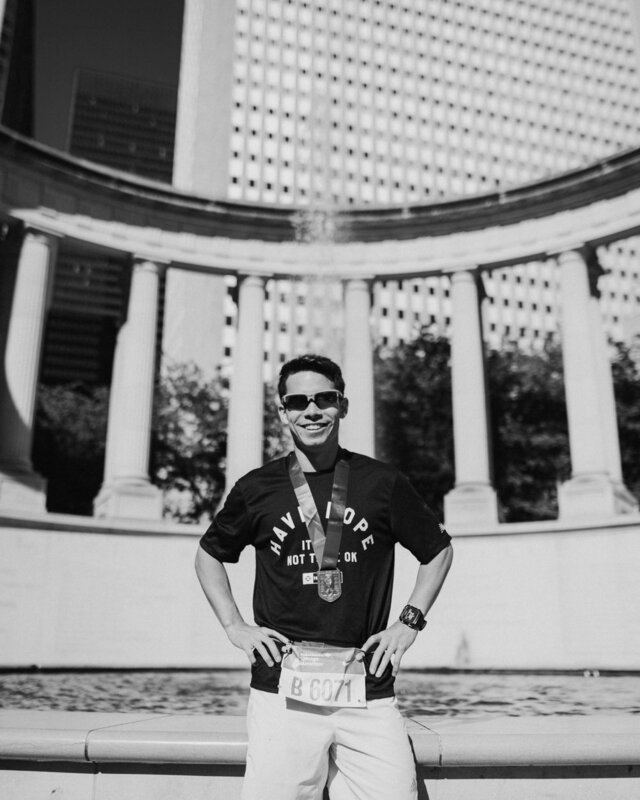 Visit Team Thrive's fundraising page to donate, and support Sarah’s endeavors leading up to the Chicago Marathon on October 7, 2018! If you would like to join Team Thrive, or receive more information about how you, your friends, family, teammates, company, or members of your community can help advocate with Team Thrive and the Healthy Body Healthy Mind campaign. Please fill out the form below, and we will get back to you as soon as possible.